Honestly, my thoughts on this series are very mixed. I thought the first book, A Court of Thorns and Roses, was good, except for the grossly romanticised abuse. The second book, A Court of Mist and Fury, may very wel be one of my favorite books of all-time. My feelings on A Court of Wings and Ruin, the third book in the series, are a mix of “OMG, I LOVE THESE CHARACTERS AND I LOVE THIS WORLD, COME HERE MY PRECIOUS BABIES” and “OMG you have ruined the word mate for me forever. There is a war going on, hurry and put on some pants damnit”. So I was a bit hesitant to start the novella, A Court of Frost and Starlight. Because of the aforementioned mixed feelings and because really, I just don’t like novellas. But I figured I still want to continue this series either way, so I just couldn’t miss out on this novella. And truthfully? Plotwise, I could have totally missed out on this novella. NOTHING HAPPENS. It’s just a glorified epilogue. Or a glorified prologue to the next book. There is no real plot. You will not miss out on major stuff if you don’t read this one. But emotionally? Yes, this book brings the good stuff. Because over the past three books, I have become so emotionally attached to these characters. I love them. I wish I was one of them. I wish I could celebrate Christmas with them. And through this novella, I could. There are so many wonderful character moments as we check in with each member of the Inner Circle. The major difference between the novella and the books is that we get multiple POV’s. We of course have Feyre, but we also have lots of Rhys and even a lot of Cassian, Mor and Nesta. Through this, we check in with this lovely group of friends and see how each of them is doing. We even check in with Lucien and Tamlin. Funny thing though is that Feyre and Rhys’ POV’s are written in first person, while everyone else’s POV is written in third person. A little jarring, but once you get used to it… nope, it still stays weird. Honestly, there is not much to review here. Don’t read this if you really need a plot. But definitely do read this if you love this group of characters and just want to see them celebrate Christmas (or well, Winter Solstice) and witness their antics such as drunken decorating, snowball fights, terrible (or amazing) tastes in gifts, awkward sauna trips and so much more. And I just have to add that while I’m still not a fan of novellas, this one got me super excited for the next book in the series, when I wasn’t really all that interested before. So I consider that a major win for this novella! 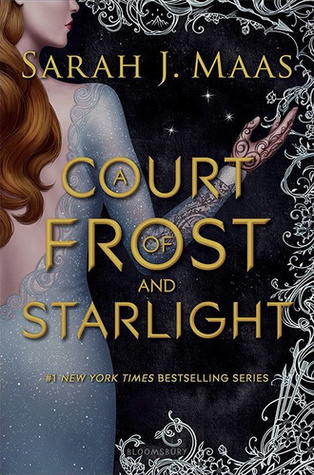 HAVE YOU READ A Court of Frost and Starlight? WHAT DID YOU THINK ABOUT IT? A lot of bloggers seem to be annoyed about the lack of plot, and it’s a pity about that 🙁 But I’m glad it’s character driven, and you get a lot of awesomeness from them! I love this cover, too. Probably my favourite of the series. You perfectly summed up what most people feel about this! I’ve read reviews on both ends of the spectrum: people who hated it because nothing of note happens and people who loved it because the squad is amazing and hilarious (I’m from the latter!). Personally, I loved it because of what you mentioned: the characters are adorable and hilarious and wonderful! I also thought it made a great bridge between the first and second parts of the series in this world. Lovely review, Lindsey!